that was a very thoughtful and evenhanded post, and i am largely in agreement with you. the question i'm left with, is this an amateur psyop by devoted trump fans and/or internet chaos agents? or is the call really coming from inside the house, i mean, the administration? forgive me, trump fans, but this seems a little too clever to actually involve the current administration... so i lean towards my former supposition. It's been confirmed that NATO used Tornado GR4's which are old and seem like an odd choice. Because it proves that this strike on Syria was a joint effort between Russia and NATO. Russia was vocal about it's plans to shoot down any missiles and destroy where they were launched from. The Russian S400 missile defence units were designed to take on much more sophisticated threats ( like stealth fighters ) so Tornado GR4's would be been easy intercepts. They stood down. Purposely. Because the targets that were hit were deep state targets. All the hoopla on ATS and this thread in particular about the missile strikes is bunk. Let the normies hoot and holler all they want. We are actually winning. As alluded to in Q message #992 @ qanonposts.com... tomorrow is PATRIOTS DAY. Monday April 16th could be a very good day for Patriots! Let's pray this is what it says then.? There was talk around Lions a while back in relation to a post that contained "Billions". Bashar Hafez al-Assad was born in Damascus on 11 September 1965, the second oldest son of Anisa Makhlouf and Hafez al-Assad. Al-Assad in Arabic means "the Lion"; Assad's peasant paternal grandfather had changed the family name from Wahsh (meaning "Savage" or "Monster") upon acquiring minor noble status in 1927. The jets took off from RAF Akrotiri, the Royal Air Force base on Cyprus in the eastern Mediterranean, and targeted a Syrian chemical weapons site in Homs, the British Ministry of Defense said. Granted, there was more to it. Other hardware was used as well, but the specific target of the Tornados is of interest. 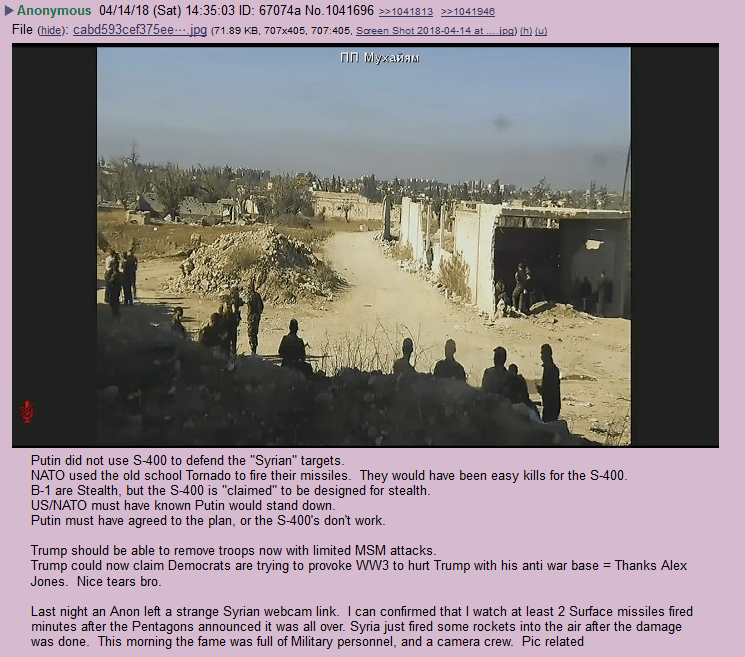 The "research facility" in Homs may very well be the one linked to McCain & co. Published on Apr 7, 2017 Do you think the Syrian chemical attack was a false flag? Wait a minute... So we've already been told that terrorists=deep state=clowns, and now Iran is the next stop for fighting them? What a coincidence! That's where the deep state wanted us to fight too... But thankfully Trump is ending the war on terror, nice! Now we just have to fight the war on clowns, instead, and then we can go home! I believe it! I believe in coincidences!